TCM is celebrating the Fourth of July with Yankee Doodle Dandy (1942). 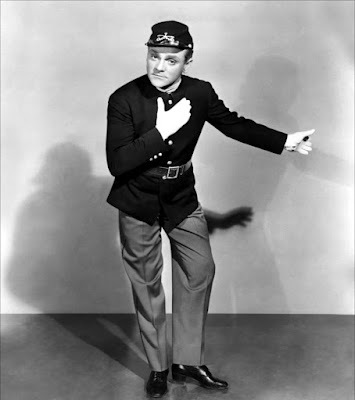 The patriotic musical stars James Cagney as legendary Broadway showman, George M. Cohan. Every Wednesday and Friday in July, TCM is airing a marathon of movies from English director Alfred Hitchcock (there's an indepth guide below). There's also a lineup of musicals for Independence Day and an evening of films from star of the month Ronald Colman. Birthday tributes: Janet Leigh on Thursday. Noir Alley: Dennis O'Keefe and Alfred Ryder play U.S. Treasury agents who go undercover to break up a counterfeiting ring in director Anthony Mann's low-budget noir T-Men (1947) at 10 a.m. Sunday. This film features sensational photography from cinematographer John Alton. TCM Essentials: The monster (Boris Karloff) gets a wife (Elsa Lanchester) in the Universal Pictures horror film The Bride of Frankenstein (1935) at 8 p.m. Saturday. Silent Sunday Nights: Three Harold Lloyd shorts starting at midnight. His Royal Slyness (1920) is a Prince and the Pauper like tale of an European prince (Lloyd's brother, Gaylord) who trades places with an American salesman; In Among Those Present (1921), coat checker Lloyd impersonates a nobleman to ingratiate himself with high society. Finally, Lloyd escorts a young girl (Anna Mae Bilson) on a cross-country trip in Now or Never (1921). TCM Imports: Two films from Finnish director Aki Kaurismaki starting with the comedy-drama Shadows in Paradise (1986) at 2 a.m. about a shy grocery store clerk (Kati Outinen) and an equally meek garbage man (Matti Pellonpaa) who strike up an unlikely romance. Ariel (1988) at 3:30 a.m. follows the travails of an unemployed, rural coal miner (Turo Pajala) who tries to find work in the city. Best Day to DVR: Tuesday afternoon and prime time. Celebrate the Fourth of July with some of old Hollywood's best musicals starting with the tuneful Romeo and Juliet redux West Side Story (1961) at 1:30 p.m, the baseball musical Take Me Out to the Ball Game (1949) at 4:15 p.m., and the pioneer days toe-tapper Seven Brides for Seven Brothers (1954) at 6 p.m. It wouldn't be Independence Day on TCM without either Yankee Doodle Dandy (1942) at 8 p.m. or 1776 (1972) at 10:15 p.m. Round out your evening with fast-talker Robert Preston explaining the meaning of "Trouble" to the citizens of River City, Iowa, in The Music Man (1962) at 1:15 a.m.
50 Years of Hitchcock Wednesday: TCM is giving viewers an unprecedented opportunity to watch more than 40 films from the master of suspense throughout July. Since there's so much to worth watching I'll add two special sections this month. The lineup: Boxing drama The Ring (1927) at 8 p.m.; psychological drama Downhill (1927) at 9:45 p.m.; rural comedy The Farmer's Wife (1928) at 11:45 p.m.; thriller The Lodger (1927) at 1:45 a.m.; melodrama The Manxman (1929) at 3:30 a.m.; Hitch's first sound film, Blackmail (1929) at 5 a.m.; whodunit Murder! (1930) at 6:45 a.m. Thursday; stage-to-screen adaptation The Skin Game (1931) at 8:30 a.m. Thursday, and romantic comedy Rich and Strange (1932) at 10 a.m. Thursday. Must watch: The Lodger. 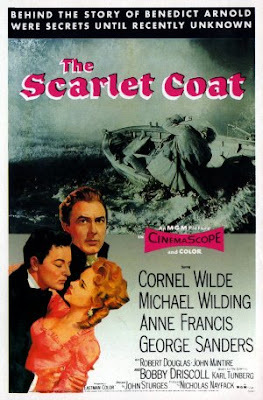 At this point in his career, Hitchcock was a fledgling director who took whatever assignments were handed to him. He got his first real chance to work in the suspense genre in The Lodger, which was based on a novel and play about a strange young man (Ivor Novello) who might be responsible for a series of Jack-the-Ripper like murders. 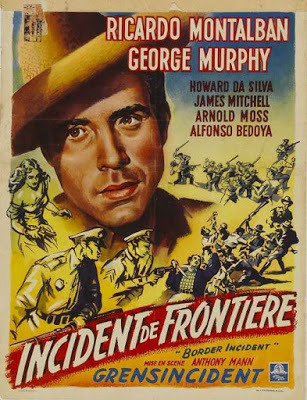 Watch for a great performance from Novello, atmospheric shots of London (the subtitle is "A Story of the London Fog"), and many of the director's signature touches (blondes; bumbling policemen; staircases). Also worth your time: Hitch enlivens the boxing saga The Ring with lots of stylish visuals that anticipate his later masterpieces. The Farmer's Wife is a surprisingly touching story about a widowed man (Jameson Thomas) who decides to get back in the marriage game. Underrated gem: Murder! is an Agatha Christie-like whodunit that features Herbert Marshall as a juror turned amateur detective. Dud: The Skin Game, about a feud between a noveau riche family and landed nobility, is a boring, overly talky mess that Hitch always claimed he was forced to direct. 50 Years of Hitchcock Friday: Tonight features the British films Hitchcock made before he emigrated to the U.S. in 1939. Lineup: Caper movie Number Seventeen (1932) at 8 p.m. Thrillers The Man Who Knew Too Much (1934) at 9:30 p.m., The 39 Steps (1935) at 11 p.m., and The Lady Vanishes (1938) at 12:45 a.m. Swashbuckler Jamaica Inn (1939) at 2:45 a.m. and World War II propaganda films Aventure Malgache (1944) at 4:30 a.m. and Bon Voyage (1944) at 5:15 a.m.
Must-sees: Hitch's two thirties masterpieces, The 39 Steps and The Lady Vanishes. Also worth your time: The original version of The Man Who Knew Too Much isn't as technically sophisticated as the 1956 Hollywood version, but it still has plenty of high points, especially villain Peter Lorre in his first English language role. Underrated gem: Number Seventeen, about a bum (Leon M. Lion) who stumbles on a nest of jewel thieves, has plenty of Hitch's trademark dry humor and an exciting chase sequence. Dud: The Daphne du Maurier adaptation Jamaica Inn has its moments, but its often weighted down by a plodding story and Charles Laughton's hammy acting. 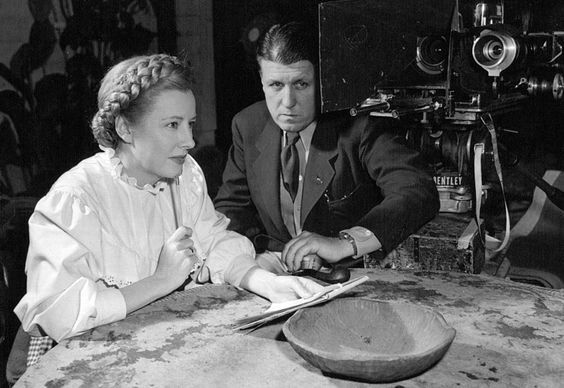 Irene Dunne and director George Stevens prepare to film a scene for I Remember Mama (1948). Three daytime picks: The morning theme is movies with songs written by Nacio Herb Brown starting with the island adventure The Pagan (1929) at 7 a.m. in which Ramon Novarro warbles "Pagan Love Song" to the object of his affections (Dorothy Janis). The afternoon is devoted to films starring songbird Kathryn Grayson starting with her role as a snooty woman Andy Hardy (Mickey Rooney) hires to be his social secretary in Andy Hardy's Private Secretary (1941) at 2 p.m. Grayson plays opera singer and actor Grace Moore in the biopic So This Is Love (1953) at 5:45 p.m.
Prime time lineup: TCM is airing a night of movies about immigrants, starting with director Elia Kazan's film America, America (1963) at 8 p.m. about a young Greek man's struggles to get to the U.S.
Late night pick: TCM fan favorite I Remember Mama (1948) at 11 p.m. is about a Norwegian immigrant family living in turn-of-the-century San Francisco. Three daytime picks: Before the musicals start in the afternoon (see the "Best Day to DVR" section), you can enjoy the Andy Hardy film Judge Hardy and Son (1939) at 6:30 a.m. and the Revolutionary War spy saga The Scarlet Coat (1955) at 10:15 a.m.
Joan Bennett and Edward G. Robinson in Scarlet Street (1945). Three daytime picks: The morning theme is movies directed by Fritz Lang. There's two great noirs, starting with Scarlet Street (1945) at 8:30 a.m. starring Edward G. Robinson as a meek painter who is taken to the cleaners by femme fatale Joan Bennett and her wily boyfriend (Dan Duryea). Next, newlywed Barbara Stanwyck finds herself torn between her schlubby husband (Paul Douglas) and his handsome best friend (Robert Ryan) in Clash by Night (1952) at 10:30 a.m. The afternoon is devoted to movies directed by Sam Peckinpah, including the Western Ride the High Country (1962) at 4 p.m. about two aging friends (Joel McCrea and Randolph Scott) who go on one last adventure. Three daytime picks: For the Hitchcock films airing on Thursday morning see "50 Years of Hitchcock Wednesday" section. The afternoon is devoted to a birthday tribute to Janet Leigh, who was born Jeanette Morrison July 6, 1927, in Merced Calif. The lineup starts with her iconic role in Hitchcock's horror classic Psycho (1960) at noon. One of Leigh's first major roles was playing eldest March sister, Meg, in the 1949 adaptation of Little Women at 5:45 p.m.
Prime time lineup: TCM July star of the month is leading man Ronald Colman. Tonight's lineup features his silent and early talkie films starting with The World War I melodrama The White Sister (1923) at 8 p.m. about a young Italian woman (a magnetic Lillian Gish) who believes her lover (Colman) was killed in battle. Engineer Colman battles cowboy Gary Cooper for the affections of rancher's daughter Vilma Banky in The Winning of Barbara Worth (1926) at 10:30 p.m.
Late night pick: Colman plays gentleman adventurer Bulldog Drummond (1929) at 12:15 a.m. in his first sound film. Three daytime picks: The Colman movies continue in the morning with the pre-code Sinclair Lewis adaptation Arrowsmith (1931) at 6:30 a.m. about an idealistic young doctor (Colman) who is tempted by Helen Hayes and Myrna Loy, The rest of the daytime lineup features films directed by Anthony Mann starting with the unusual noir Border Incident (1949) at 9:30 a.m., which is about illegal immigration along the Mexican border. There's also the great Korean War film Men in War (1957) at 3:45 p.m. about a group of soldiers led by Aldo Ray and Robert Ryan who get separated from their division. The Essentials series continues at 8 p.m. with new host Alec Baldwin. He will be joined by his former 30 Rock costar Tina Fey to discuss director James Whale's horror film The Bride of Frankenstein (1935) at 8 p.m. followed by three more films helmed by Whale: the swashbuckler The Man in the Iron Mask (1939) at 9:45 p.m., and the musical Show Boat (1936) at midnight (this movie features several of the original stage stars including Irene Dunne, Helen Morgan, and Paul Robeson). The night winds up with another horror film The Invisible Man (1933) at 2:15 a.m.
TCM's prime time lineup is all about movies from the husband and wife team of director Frank Perry and screenwriter Eleanor Perry. First up is the disturbing nuclear holocaust parable Ladybug Ladybug (1963) at 8 p.m., which was inspired by both the 1962 Cuban Missile Crisis and Eleanor's feminist principles. David and Lisa (1962) at 9:45 p.m. is about two young people (Keir Dullea and Janet Margolin) who fall in love while at a psychiatric treatment facility.